Provincial Police Bureau Region 5 is preparing to take charge of all security arrangements during the coming tourism season. This will be one of the sights on Saturday at the Meditation Center Sansai, nearby Maejo University. The festivities will start as soon as the sun sets, and it is advisable that all those interested should be at the location ahead of time. Parking can be difficult. For more information about the upcoming Loy Krathong “Yee Peng” activities in and around Chiang Mai, please turn to page 3. Commissioner Pol Lt Gen Panupong Singhara na Ayuthaya said that the next few weeks will be a particularly active time during the season, with Loy Krathong and the New Year festival along with various local activities within the eight Northern provinces. Many visitors will come simply because of the cool weather, and the scenic beauty of the region with its mists and winter colors. Loy Krathong takes place November 9-17, with many activities around Thapae Gate and the Chiang Mai Municipality office area. A large number of Thai and foreign visitors is expected, and the provincial police will be there to take care of security and other community services. Special provision has been made by the Bank of Agriculture and Agricultural Cooperatives for farmers who suffered in the recent flooding. (From left) Choochoke Thongtaluang, head of Chiang Mai Provincial Public Relation Office and Boonlert Teuanyeonyong, director of Bank for Agriculture and Agricultural Cooperatives Chiang Mai office jointly give information in a press conference. Boonlert Teuanyeonyong, director of the bank’s Chiang Mai office, together with Choochoke Thongtaluang, head of the Chiang Mai Provincial Public Relations Office, held a briefing on November 4 to announce that at the second trimester from April 1 to September 30, the bank had 120,096 household clients and authorized 3,833 million baht of debt. Because of the floods, agriculturists whose farms were damaged by more than 50 percent have had their loans rescheduled for one year and interest will be waived for three years. Further loans have also been authorized. The director said that the bank is able to provide training in easy accounting methods so that households and agriculturists can record their daily income and outgoings, and enjoy better management of their finances to enable them to save more. He added that by depositing money at the Bank for Agriculture and Agricultural Cooperatives, individuals are doing more than saving for themselves, they are also helping other agriculturists. For more information call 0 5341 6995-6 or any branch of the bank. Chiang Mai Mayor Boonlert Buranupakorn said the municipality in cooperation with Chiang Mai Provincial Public Health Office is carrying out rigorous checks to see if there is any indication of the bird flu virus in the province. Chiang Mai mayor Boonlert Buranupakorn. Officers have been traveling throughout the municipality area and almost a thousand community leaders and volunteers from 80 communities have been working together to check for signs of the virus. There is also an educational program for residents telling them how to spot symptoms in winged livestock, and to report on bird and fowl deaths to relevant municipal officials in their area. An extensive program of antiseptic spraying is being carried out in livestock areas. The mayor added that there are four areas registered to check winged livestock, namely Kawila, Nakorn Ping, Meng Rai and Sri Wichai. Instrumentation has been installed at Chiang Saen Port to check the health of cargo crews arriving on vessels from China, as part of the region’s fight against the spread of avian flu. Tinnakorn Jaikhamkrua, of the public health office control point at the port, said the equipment came into use on November 2. Amongst other checks it reads body temperature. Almost 100 crew members from a total of 10 cargo ships were checked, and all proved to be healthy. Chiang Rai Provincial Livestock Office has meanwhile disclosed that dead chickens in several areas of Chiang Rai and Thoeng were checked out for avian flu but were found to have died from unrelated causes. Mae Maw tin mine has received an award from the Department of Primary Industries and Mines for best management and business standards. Anusorn Nuangponmak, director general of the department, presented awards to the best mines in the country. Out of a total of 1,304 mines, 32 were selected for awards. Mae Maw’s planning and administration manager Chooyode Sutharatanachaiporn received the award on behalf of the mine. Anusorn said that to run a business and reach good standards required good management at all levels, including safety, hygiene, administration, management, environment, manufacturing technology and participation with government and community. 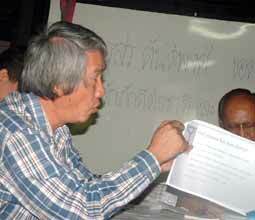 Chooyode said that Mae Maw tin mine had received ISO 14001 certification in 2000. 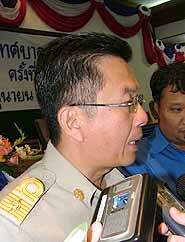 Mae Hong Son Governor Direk Konkleeb has cautioned people to be careful of the changeable weather. The low atmospheric pressure from China will cover the North of Thailand and temperatures will decrease sharply, becoming very cold in the hilly areas. Blankets and coats should be prepared and kept ready. A survey by the Office of Disaster Prevention and Mitigation has revealed that almost 80,000 people in seven districts of Mae Hong Son are at particular risk from the cold weather. The survey has logged the numbers in details. The total is 72,052 people. By district these are 4,610 people in Muang, 3,752 in Sop Moei, 6,548 in Khun Yuam, 10,671 in Mae Sa Riang, 11,950 in Mae La Noi, 3,587 in Pang Ma Pha, and 30,938 in Pai. Almost all are elderly and people who have low incomes. It is predicted that at least 90,000 blankets and coats will be needed to meet needs. Eight Northern provincial governors are preparing for a visit to Japan where they will study the art of world class expo organization and management. Napasit Jakpitak, director of the College of Arts, Media and Technology at Chiang Mai University, who is also responsible for upgrading handicrafts related tourism in Northern Thailand, said that a firm strategy had been provided for eight Northern provinces. Work has already begun, and Sukin Wongsa, the president of NOHMEX, will report on progress to Deputy Prime Minister Somkid Jatusripitak. The next plan is to take the eight governors to visit Nakoyama, Japan where they will be joined on the trip by the director of the Northern Economy and Social Development Council. Another part of the strategy for the eight provinces will see planners visiting Ubut, in Bali, one of the world’s leading handicraft cities. They will learn how to manage community and business affairs there, and then will continue on to Hong Kong, one of the best known international exhibition centers. All the planning is being done with the World Craft Expo 2009 in mind, and the faculties of engineering, business administration and economics at Chiang Mai University will jointly consider the standards of the expo. IC-ACE will host a series of programs during International Education Week 2005. November 16 and 17, 2005: IC-ACE’s “road trip” outreach program to leading schools/colleges in northern provinces of Thailand. The highlight will be presentations by a senior official from California State University-East Bay to announce a Direct Admit and Scholarship Program for undergraduates, as well as two generous TESOL Certificate Scholarships for English-language teachers. November 18, 2005: IC-ACE’s third annual U.S. Education Expo, “Ed-eXpo USA 2005”, will be held at International Center and American Corner of Chiang Mai University. US Consul General Bea Camp will be Honorary Patron of the event. * “Meet the Visa Officer”: Consular Officer of the US Consulate General-Chiang Mai will conduct a public workshop to update and provide guidance on US student visa applications. * US Education Panel Talk: Cal State-East Bay and University of San Francisco will speak on distinctive advantages of US public and private college education. * Door gifts for all visitors, with Raffle Draws for attractive prizes, including IC-ACE scholarships for Test Prep (TOEFL, TOEIC, GRE, GMAT, and SAT), Global English Certificates, SmoothTalk, and Teen-Trendy-Talk courses. Muang Lamphun municipality opened a new public park in the center of the city, with a ceremony presided over by Deputy Governor Chalermchai Worawutputipong. Chalermchai said that developments and traffic in the city had increased and as a result there has been an increase in pollution levels which affects the health of residents. Lamphun province considers pollution control and environmental protection to be one of its most important responsibilities, and this has led to the creation of Kunatham Public Park. The park is a new green lung for Lamphun, and a resting place, exercise area and a place for families to spend time together. It features fountains, underwater lights, elephant sculptures, and a playground. Prapat Poojareun, of Muang Lamphun municipality, said that a survey amongst residents had revealed the majority wanted to see their historic city have a beautiful environment and to enhance its reputation as a center for art and culture. This is very much in line with other projects in the Mekong River basin where the emphasis is being placed on heritage, the environment and nature conservation. The Ministry of Interior allocated a special budget of 30 million baht to the municipality for Mahawan Gate and related improvements to the surrounding area. Overall, the works include improvements to Mahawan Gate, two bridges crossing the Lamphun canal, four gates to the city, the scenery around the canal, and the public park. So far, almost 12 million baht has been spent. Dr Thawat Thapingkang, an agriculture lecturer and consultant, has claimed that since the Thai government proclaimed a Free Trade Area (FTA) with China two years ago, the affect on Thai farmers has been a negative one. Dr Thawat Thapingkang, agriculture lecturer and private consultant describing how the FTA can cause trouble for Thai farmers. There are now more goods being imported from China along the border in areas such as Chiang Saen, Mae Sai and Chiang Rai. These have low capital costs while the products from Thai farmers are higher because of the high cost of equipment and fertilizers, most of which is imported. Chinese products have therefore gained advantages over Thai agricultural products. Dr Thawat added that another failing is that the government does not pay much attention to Thai agriculture, especially in that it does little to support professional agriculture academies that would help produce products of good quality. Thai farmers are now influenced by foreign companies and this has resulted in many Thai products and plants being registered for copyright under the name of foreign companies. A survey has discovered that there are 800 companies registered for agricultural products and most of these companies are owned by Koreans, Japanese and Taiwanese. The Thai government should not ignore this issue and should do something before all Thai agricultural product copyrights belong to other countries. Dr Ah-nus Tancho, coordinator of the Northern natural agriculture network, said that initially farmers distributed agricultural products to department stores but later some government officials in association with private companies fixed agricultural product standards and hired specialty farmers to produce the product to send to department stores, consequently causing problems for other farmers. Residents up in arms over the erection of a giant advertising hoarding have been backed by Tambon Chang Puek Mayor Tassanee Buranupakorn. Tassanee said that the huge sign in front of Wat Jet Yod on the Chiang Mai-Lampang Superhighway in Muang, Chiang Mai hides the view of Wat Phra Thad Doi Suthep. Tambon Chang Puek municipality had demanded that erection of the hoarding be stopped but the contractor had finished the construction work and already had an advertisement for a beer brand on display. In the view of residents this was not appropriate, said Tassanee. The mayor said the hoarding was the responsibility of 96 Advertising Co, and that Densak Thongsang, who lives in Bangkok, had applied for the construction permit on August 4 this year at Chang Puek municipality. The process had therefore been legally approved. Subsequently it appeared the construction was larger than the initial agreement that had stipulated only 32 meters high and 16 meters wide. The municipality tried to stop construction but the company continued building the sign. On October 6 the municipality asked Chang Puek Police to intervene but the advertising company ignored directives to cease and on October 28 an advertisement for a beer brand appeared. The advertisement displays a picture of the King and therefore the municipality has appealed to Muang Chiang Mai district office to check if it is appropriate. Meanwhile, 96 Advertising Co has challenged the municipality to sue the company, and says if it loses the case the company will remove the hoarding. The mayor said she will continue with the legal process. Tourism Authority of Thailand Northern Office Region 1 and Chiang Mai municipality are to jointly organize Chiang Mai’s Yee Peng activities during November 11 to 17 at the public park next to the governor’s residence. November 12 will feature a country music show performed by the Ja Nok Rong School band from Phitsanulok, former winners of the national award from the Ching Cha Sawan show hosted by Channel 9. November 13 will see a traditional Lanna music performance, Salor Sor Seung, by Panutat “Kru Add” Aphichanathong and the singer M Attapol, winner of The Star singing contest. On November 15-17 there will be an opportunity to enjoy a reminiscence of the Lanna way of life, a recreation of Lanna traditions such as decorating arbors, making elaborate lanterns, cooking Thai sweetmeats, and making a krathong from banana leaves and a wax candle. All these are indigenous to the Northern part of Thailand. The activities focus on tracing traditions back to the ancient Yee Peng festival at the Three Kings Monument ground. Yee Peng lanterns will be placed along the Chang Klan Road. A light and sound presentation will take place at the floating stage in the Mae Ping River in front of Chiang Mai municipality office. A Miss Noppamas contest will be staged at Thapae Gate while small and giant krathongs will be paraded along Thapae Road. According to the history written by King Mongkut in 1863, the Loy Krathong festival has its roots in ancient Brahmin culture, going back some 700 years. 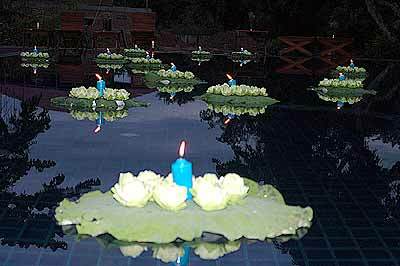 The spirits of the river were given offerings which were sailed in the river in small boats (krathongs) and in this way the owner of the krathong would gain absolution. This was a Brahmin belief. The small boats fashioned by the beautiful and talented Nang Noppamas, the daughter of a Brahmin priest and wife of King Phra Ruang, were notable for their construction and beauty. It was this king who then dedicated the krathong to the memory of the Buddha, and decreed that the event would be called Loy Krathong and that it should become an annual celebration to commemorate the skill and beauty of his consort. In this way he lifted it out of Brahmin culture and installed it into the accepted Buddhist way of life. This is the reason that the krathongs now carry three incense sticks representing the Buddha, the Dharma and the Sangha. During the Loy Krathong Festival, people decorate their krathong with flowers, joss sticks and candles which will then sail away, taking with them bad health, bad luck and unhappiness. Lanterns are well-known symbols in the Loy Krathong Festival, too, being used to decorate houses and temples in worship of the guardian spirits. There are four kinds of lantern used in the festival: the hand-held rabbit lantern, the hot air balloon lantern (kom loy), the hanging lantern for religious worship, and the spin lantern installed at the temples. The belief in lanterns is that the lights inside compare with the wisdom the people will gain in the next life. CBN Siam is happy to announce the arrival of a new music video program for teens and young adults called “One Cubed”. The program is produced in Chiang Mai and features music videos from around the world. Hosted by popular Thai-Italian actress Karen Klongtruadroke, the program will premiere on UBC’s Chic Channel (#20) on Saturday November 19 at 5 p.m. Host Karen Klongtruadroke on the set. Host Karen Klongtruadroke is probably best known by Thai audiences for her starring role in the movie, Dek Say Play. She has also acted in other movies and television programs in addition to modeling and singing. In addition to the weekly airtime on Saturdays, One Cubed will re-air on the Chic Channel on Mondays at 2.30 p.m., Wednesdays at 10.30 a.m., and Fridays at 7.30 a.m. For information about One Cubed around the world, log onto our website at: www.1cubed.com. The Chiangmai based CBN Siam also produces two other programs that can be seen nationwide in Thailand on free-to-air TV: From Heart To Heart airs every Sunday morning at 6. a.m. on iTV. Kids Only airs each Wednesday afternoon at 5.30 p.m. on Channel 11. Lampang’s walking and safety food streets made their debut on November 5, with a decor that evoked an earlier era. Nakorn Lampang municipality organized Kad Kongta walking street on Talad Jeen Road and Kad Him Wang safety food street on a route beside the Wang River near Wat Koh, in a move to promote tourism and to boost the local economy. Residents at Talad Jeen decorated their households with lanterns and mementos of times gone by. Some of the older houses even invited visitors to view inside. Local products were on display, and there were street performances. Residents and tourists alike enjoyed the event, which will continue. Kad Kongta walking street opens every Saturday and Sunday from 6.00 to 10.00 pm while Kad Him Wang safety food street opens daily during the same time. Applications are now being invited for vehicle owners to bid for lucky-number license plates, with the auction to be held on November 26 and 27 at the Empress Hotel in Chiang Mai. Autsathai Rattanadilok na Phuket, head of Chiang Mai provincial transport office, said that the Department of Land Transport is allowing each province to organize license plate auctions to raise revenue that would then be used for road safety budgets. The previous auction for Kor Yor license plates received total revenue of 22,835,000 baht. Piyaphan Champasut, director general of the Department of Land Transport has announced that revenue from private car license plate bids throughout the country has resulted in a total 684 million baht going towards road safety as of September. Up for the highest bidder this month are Kor Ror license plates with the numbers 1111, 2222, 3333, 4444, 5555, 6666, 7777, 8888 and 9999, including 1, 2, 11, 22, 33, 8899 and 8989 together with 123, 345, 1000, 2000, 1122, 1234 and 5678 plus 9669, 9090 and 9696. Autsathai said that Kor Ror means “accomplishment and riches”. These license plates will increase in value in the future, and can be handed down to descendants. To apply for the tender or to find out more call Chiang Mai provincial transport office during weekdays on 0 5327 7842. Mae Sai district will next month open an electronic passport center for tourists who wish to visit Tachilek district in Burma. Somwang Rungtrakoolchai, Mae Sai district chief officer, said that during the holidays and festival periods in particular, many tourists travel to Mae Sai and then cross over the border. There normally can be between 1,200 and 1,500 people presenting their passports at the border crossing, but during a holiday period this can double. This causes delays in service and lack of time for officials to pay full attention to individual cases. Mae Sai district had therefore requested a budget of 2 million baht from the Ministry of Interior to set up the electronic passport center. This will serve tourists by using 11 computers connected with the individual register network of the Department of Local Administration, at the Ministry of Interior. The center will be ready for service in the beginning of December, in good time for the winter tourism season. Chinese Minister Liu Yunshan visited Chiang Mai as a guest of the governor, traveling to Wat Phra Thad Doi Suthep and taking in many of the city’s sights during his stay here. Governor Suwat Tantipat hosted a Lanna style dinner for the minister and his entourage at Khum Kan Tok, where the Chinese delegation enjoyed the cultural performance. The party, which stayed at the Sheraton Hotel, also visited an elephant camp, and the wood handicraft center at Baan Tawai village. Minister Liu then left for Cambodia. The minister and his party had previously been in Chiang Rai, and had inspected the Doi Tung Development Project and Golden Triangle Opium Hall. They had met with MR Disanada Disakul, head of the Doi Tung Development Project, who had guided them around the Doi Tung Royal Villa, Princess Mother Commemorative Hall, and Mae Fah Luang Garden. Liu Yunshan had asked about the project’s background, and was briefed on Somdet Phra Srinagarindra Boromarajajonani’s concerns about the environment and the hill tribe people’s way of life. Her Royal Highness the Princess Mother had helped them to turn away from growing opium and to grow other crops instead. Ministry of Foreign Affairs officers have visited the home of a Chiang Mai woman who it is believed was kidnapped 27 years ago and taken to North Korea. Kiattikhun Chatprasert, deputy director of the ministry’s department of information, together with district chief officer Suchai Jongrak, traveled to the house of Anocha Panjoi at Nong Sae village, Tambon Huay Sai, in San Kamphaeng district. Anocha went missing in Macau in 1978 and has not been seen since. The officials were there to obtain information from Sukham Panjoi, Anocha’s elder brother. The Ministry of Foreign Affairs has said it will coordinate with North Korea in the search for Anocha. Her relatives still desperately want to know what happened to her, 27 years after she left home to go and work in Macau, where she vanished so mysteriously. Recently, there has been news from a former American soldier who had deserted and stayed in North Korea. He said that he knew a woman named Anocha Panjoi, who had been married to his friend, also an American soldier who deserted. Police are checking shops in the lead-up to Loy Krathong to see that regulations on the sale of fireworks are not infringed, following the number of injuries that occur during the festival period each year. 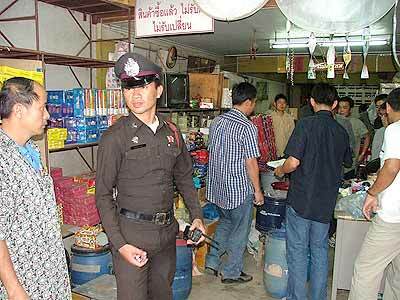 Police officers investigate Somboon firework shop. Chiang Mai municipality has announced that those who sell fireworks without authorization will be liable for penalties of up to six months imprisonment and a fine not exceeding 10,000 baht. 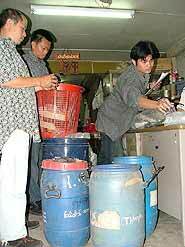 Police officers seized gunpowder and firecracker ingredients. Police investigated the Somboon fireworks shop on Tha Sa Toy Road on November 2, where they found imported fireworks along with almost 40 kilograms of gunpowder and equipment for making very large fireworks. The evidence was impounded until the owner can produce the necessary authorization. If he cannot, he will be prosecuted. Pol Col Chamnan Ruadreuw, Chiang Mai Provincial Police deputy commander, said that officers have surveyed premises in San Sai and Muang District and arrested the owners of five shops who do not have a fireworks sales permit. He said the crackdown will continue until the Loy Krathong festival is over, because firecrackers are dangerous to tourist and residents. A former jockey who became addicted to glue sniffing drowned when he fell into a canal after becoming disoriented after using an inhalant. Marine officers and rescue team retrieve the man’s body from the canal. 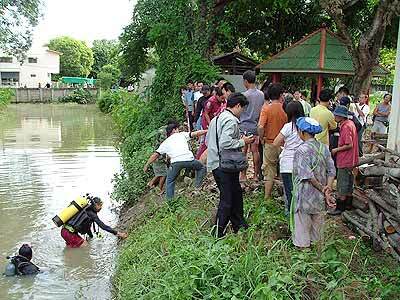 The report that a man had drowned in the canal next to the Chinese graveyard at Singh Monument was given to Chang Puek Police Station. Together with Chiang Mai municipality marine officers, they investigated the scene. On the canal bank they found a can of glue. The body was quickly retrieved and was identified as Worakan Chaipanut, 27, living in San Pa Tong. He used to be a jockey at the military race track in Tambon Nong Haw, but the army discovered he was addicted and he was retired from his position. On the day of his death, Worakan wandered along to rest at a building in the Chinese graveyard. He took inhalant on the canal bank, fell in and was drowned. His body was sent to Maharaj Hospital and his relatives contacted to collect his body. An elderly man who suffered from palsy and who had become seriously depressed shot himself at his Muang Mai Market home. Police officers checking the second floor of the building. Chang Puek police and the Ruam Jai Rescue Foundation were called out on November 8 to the address on Muang Samut Road Soi 2. The property is a two-story building, the first floor being a grocery and the second floor a residence. The officers found the body of the grocery store owner, 72-year-old Kamon Luangtrakoon, on the second floor. He had shot himself in the stomach with a Smith and Wesson .38 revolver. The gun lay beside his body with five bullets left in the chamber. The dead man’s son, Prinya, 29, said that no one had realized the sound was a gunshot, thinking at first it was a firecracker. It was a little later that Prinya had found the body. He told the officers that his father had become very depressed as he suffered from palsy. He had recently undergone treatment at Maharaj Nakorn Chiang Mai Hospital. After that it had appeared his father’s condition had improved because everyone at home had helped him to do physical therapy, but to no avail. Lampang journalists say they are being threatened following reports they have published on problems with a local garbage pit. On November 3, Chatree Yodsomsaen, president of Nakorn Lampang journalist club, presented a petition to Lampang Governor Amornthad Niratisayakul on behalf of the media complaining reporters have been intimidated and requesting that action be taken against those making the threats. News stories have been appearing regarding the social and environmental problems continually afflicting residents near the garbage pit. The press says that organizations or persons concerned with the pit have issued the threats and that if the situation is ignored there are fears for the safety of the reporters. There is also the possibility that operators of other garbage disposal areas could be encouraged by media silence and feel they could get away with similar actions. The media would like all police stations to check local politicians or even former local politicians and others who are involved with garbage pit benefits. Furthermore, a seminar concerning garbage pits in Lampang should be organized to deal with this problem in a constructive manner. The governor accepted the petition presented by a delegation of almost 20 reporters and said that he will do what the media requests. He encouraged the press to continue reporting news and to advise him of any further threats. The province has prosecuted garbage pit operators on eight previous occasions for infringements and would continue to watch the situation closely. A 34-year old Tai tribesman from Burma was arrested by Mae Hong Son Provincial Police, acting in cooperation with ONCB Northern Region, when he attempted to transfer 10,000 amphetamine pills to undercover officers acting as drug purchasers. The man, named as Teng (family name unknown), told police that he had studied in Pang Mapha for two years and always traveled between Mae Hong Son and Burma. He had twice transferred drugs, he said. The first time he was hired for 30,000 baht to courier ya ba to Wat Papao in Chiang Mai. This time he received 10,000 baht to transfer the drugs from a city in Burma to hand to the purchasers who proved to be undercover officers. Teng, who was arrested at Baan Napa Pak-Baan Huay Makeua Som Road in Muang, Mae Hong Son, said that two other drug dealers named Jai and Han had already fled to Burma. There were Thais also involved but Teng said he was not prepared to divulge their names.